Home / Region / Baton Rouge / LAFM TV 10th Season Starts Today! Tenth Season of LAFM TV Starts Today! As we get ready to start the 10th season of our show, Lee Brecheen and everyone at LAFM would like to thank all of our supporters, advertisers, and fans. It has been a great 10 years. Looking at this weeks show, Ronnie Estay (Canadian Football Hall of Fame, Former Edmonton Eskimo and LSU Tiger) is our guest. Ronnie will share stories from his past and talk with Lee about this year’s LSU Team. Starting this season, Lee Brecheen will be doing college and high school game picks with assistant Reid Althage. We will be continuing our 1A-5A Players of the Week. 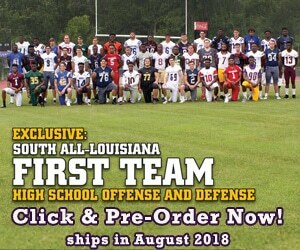 We will also have a recruit video from one of the top QBs in North LA. Tune in tonight to LAFM TV!